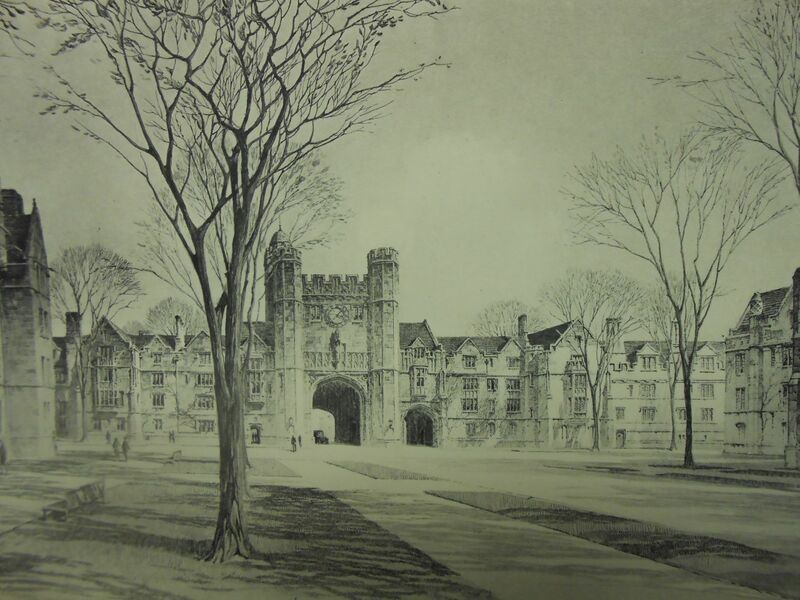 Nearing the end of the second decade of the twentieth century, as the new Memorial Quadrangle dormitory buildings were approaching completion, the President and Corporation of Yale University hired the architect John Russell Pope to devise a plan for the expansion of the university. 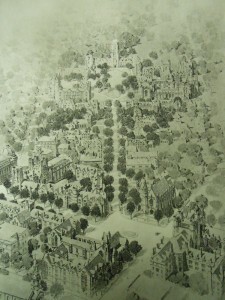 Pope’s plan aimed “to call attention to the immediate necessity of creating and safeguarding a good, orderly, practical arrangement of architectural harmony and beauty in the existing and future structures of Yale University and to present a plan whereby this result may be attained.” The resulting publication, Yale University: A Plan for Its Future Building, with illustrations by O.R. Eggers, was printed by the Cheltenham Press of New York City in 1919 in an edition of 250 copies. This large and beautifully illustrated book envisions a Yale campus rapidly expanding to meet the needs of a twentieth-century university. It is fascinating to contemplate some of the changes that Pope suggested, but that were never in fact implemented. 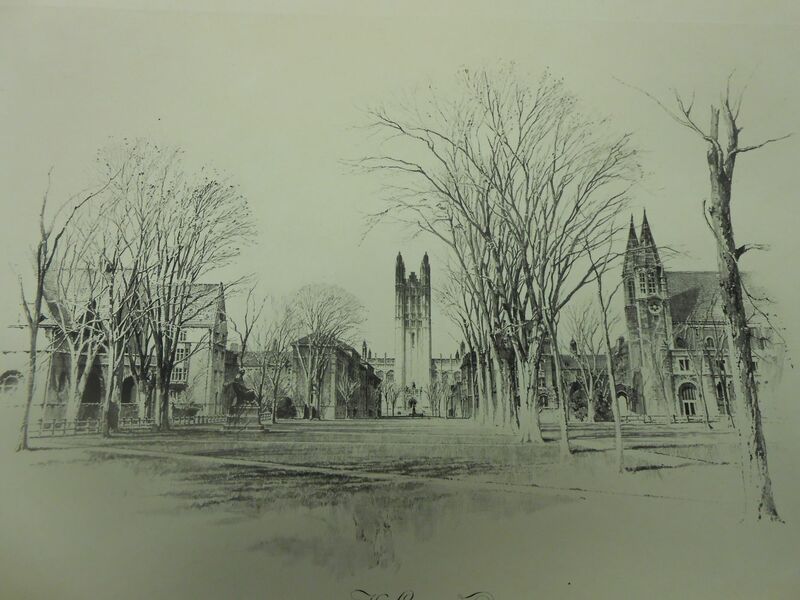 Elements of Pope’s plan can be seen in today’s Yale campus, but the plan was significantly revised during the building boom of the 1920s and 1930s, overseen primarily by architect and Yale alumnus James Gamble Rogers (B.A. 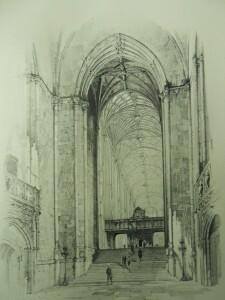 1889). Pope conceptualized a focal dividing point between the city of New Haven and the university, instantiated in an arched entryway at the intersection of Wall and Temple Streets with wings of the surrounding building stretching towards Church Street. Behind the arched entryway, Pope’s plan included a group of Gothic buildings surrounding a central Square, off of which emanated the two principle spokes of Wall Street and Hillhouse Avenue, along which his New Campus buildings would be constructed in a harmonizing unification of many existing campus structures. Pope’s plan preserved the science focus of the buildings along lower Hillhouse Avenue that had accompanied the development of the Sheffield Scientific School over the latter half of the nineteenth century, and expanded them northward culminating in a new observatory tower at the end of the axis. It also envisioned extending Hillhouse Avenue so that it intersected with the new Square centered around Wall Street. 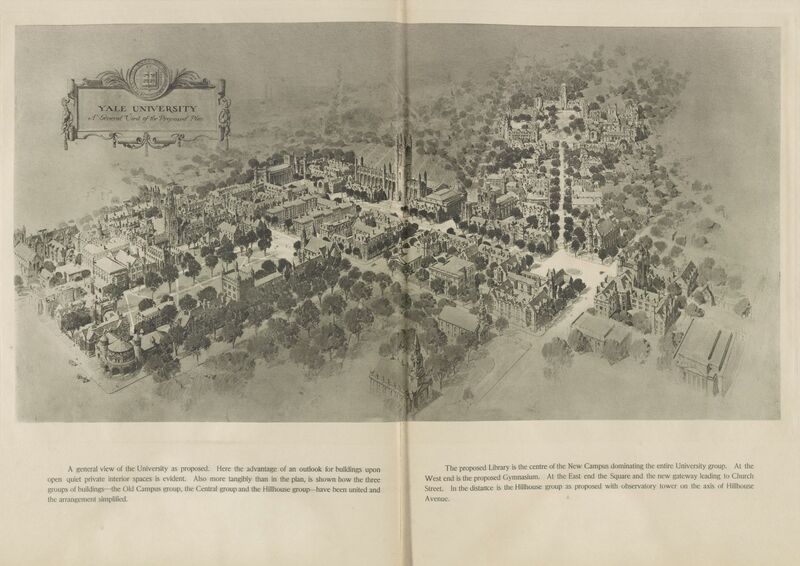 Pope called for a New Campus, stretching from York Street towards the new Square along his Wall Street axis, uniting Yale’s existing Old Campus and the newly constructed Memorial Quadrangle with his overall plan. 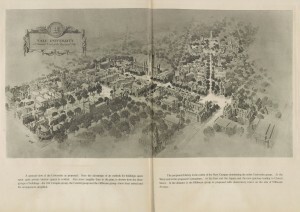 His plan indicates a new Library building between Wall and Grove Streets and occupying most of the area between the 1901 Bicentennial Buildings (Woolsey Hall, Memorial Hall, and Commons) and York Street, covering space now occupied by the Beinecke Library and the Sterling Law Buildings. 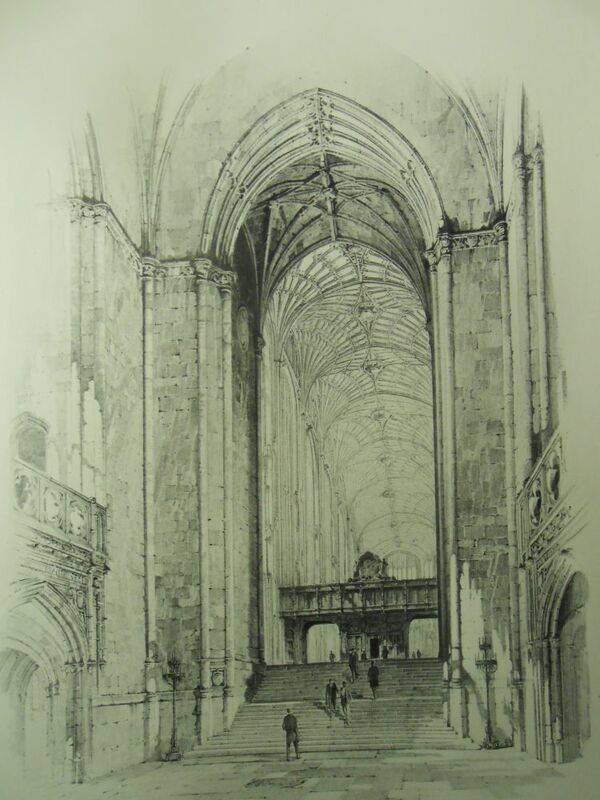 Pope’s envisioned library was a towering Perpendicular Gothic cathedral, more awe-inspiring and perhaps less functional than the Collegiate Gothic Sterling Memorial Library structure that James Gamble Rogers eventually built slightly farther south. 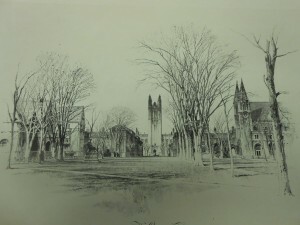 The tower of Pope’s library, facilitated by the removal of Durfee Hall, was conceived as a focal point connecting Yale’s Old Campus to Pope’s vision for a twentieth-century Yale University. This entry was posted in Collections, Yale History by bl326. Bookmark the permalink.